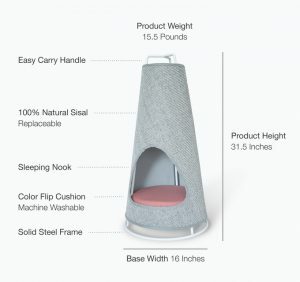 While looking around Kickstarter recently where I was really interested in The Cat Rescuers project, I happened to see a campaign for this interesting piece of kitty furniture. Billed as The Cone and being (hopefully) made by WISKI I was pretty impressed by its shape and size so had to have a further look. As this Kickstarter campaign has just launched this is the perfect time to pick up some discounts on a finished piece. As well as being able to help kickstart a fledgeling company. I always like small companies such as this starting up with pretty innovative and gorgeous looking pet products. In this case, the founder of WISKI, Evan Ryan designed The Cone after becoming frustrated at the lack of scratching options in the pet aisle. I think we have all thought the same thing though. Our homes are filled with modern furniture with muted colors and sleek designs. And yet when we look for scratching posts, cat trees and sleeping options for our cats we find the same old look and colors. We, on this site though love bringing you different looking products and we have been finding some great scratching posts by innovative small start-up companies. 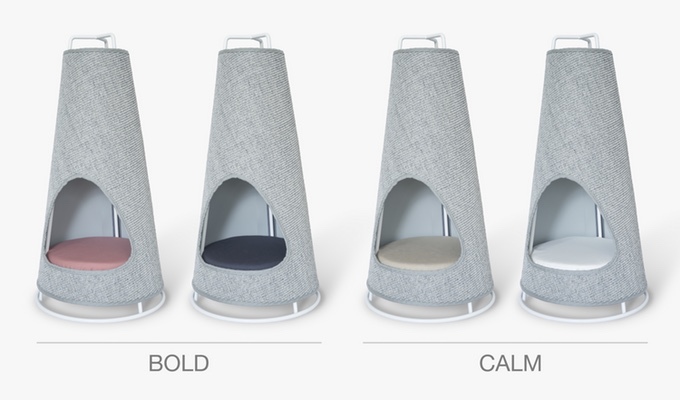 This is a gorgeous looking scratching post which also doubles as a sleeping area for your cat. As it says on the tin the actual shape of this scratching post is like a cone. So very different to other products out on the market. This shape gives The Cone stability which is important as it is over 30 inches tall. This means that cats can have a full stretch whilst using the cone scratching post. And it will not tip over. The post itself is made from solid steel rods which have been powder coated to give them a look which does not fade. The scratching area then acts like a sleeve which fits over the cone shaped steel rods. This scratching area is made from a strong sisal and the sleeve has a zip through the full length for easy removal. As an even bigger bonus, you can easily change the sisal sleeve and the manufacturer is hoping to offer replacements. This would make it very long lasting even though the creator expects the initial sleeve to last longer than five years. I love that the base of The Cone has also been converted into a cosy sleeping area for your cat. It is nicely off the floor and this area gives them some privacy. 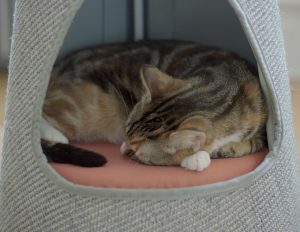 Your cat also gets to sleep on a comfy cushion which has two different colors on each side for two different looks for your house. You can also choose between the Bold cushion cover of brick and navy or the calm cover in sand and ivory. The scratching post is as we have said tall and sturdy which also helps if your cat (or cats) love playing, jumping and climbing. 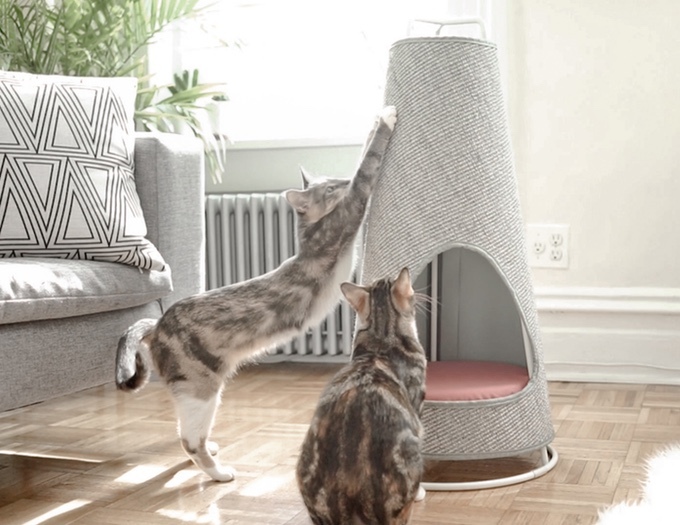 No-one wants a scratching post that tips over onto your cat and The Cone has been tested with many sizes of kitties. Also, the cushion for the sleeping area is completely washable so you can keep your Cone hygienic. And if you have wooden floors and are afraid that the steel frame will scratch. Well, it comes with soft vinyl feet for hard floors which stop the cone from sliding across your floor or scratching the finish. The Cone is also easy to pick and move about the house because the top of the steel frame also doubles as a handle. Pop over to WISKI’s Kickstarter page to have a look at more information about The Cone and how you can benefit from a backer deal.